Pharmaton Multivitamin Capsules contains a unique plant extract G115® – extracted from the Panax Ginseng plant. Pharmaton Multivitamin Capsules contain vitamins, minerals and standardised Ginseng Extract G115 which meets the body's daily requirements. Pharmaton vitamins combats symptoms caused by fatigue, tiredness, exhaustion, aging and convalescence associated with decreased mental capacity, alertness, concentration and memory. What Are Pharmaton Recoomende For? The capsules are indicated for relief of: feeling of exhaustion and stress, tiredness, feeling of weakness, vitality deficiency. Pharmaton vitamins is the only clinically proven multivitamin product to help relieve Daily Fatigue for men and women. What Are The Benefits of Pharmaton Multivitamins? Pharmaton capsules contain vitamins, minerals and Ginseng Extract G115 in amounts to meet the body's daily requirements. Pharmaton vitamins are indicated for relief of exhaustion caused by stress. Pharmaton multivitamins are also indicated for tiredness, feeling of weakness and vitality deficiency. What Are Pharmaton Multivitamins Main Health Benefits? Pharmaton vitamins helps you to effectively carry oxygen in your blood, which can increase energy production for better physical performance and cell protection. Does Pharmaton Vitamins Have Side Effects? 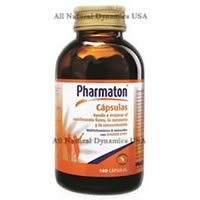 A recent observational study has shown that Pharmaton is almost devoid of side effects and does not influence blood pressure parameters, nor does it cause any weight gain effects. The safety of Pharmaton has been demonstrated conclusively in several clinical trials, and has been confirmed by the extensive use of the product in the last few decades. Where Is Pharmaton Vitamins Made? Pharmaton vitamins is an exclusive Swiss formula with a proper balance of vitamins and minerals needed by the body.It conatains unique ingredient such as, Ginseng G115 which helps protect cells against natural wear caused by stress. The G115 is a ginseng extract with clinically proven studies worldwide. The standardized G115 is Pharmaton exclusive ginseng extract. G115 is obtained from the root of Panax Ginseng, originally from South Korea and China, It has advantages as it is considered of good quality and rich in active ingredients which makes Pharmaton vitamins the big difference. How Does Pharmaton Multivitamins Work? What Are Pharmaton Vitamins Effects? Ginseng G115® influences your body’s use of energy – thus reducing daily fatigue – mainly as a consequence of the increased capacity for oxygen uptake. The extract also acts on the central nervous system and helps minimize stress, physical and mental tension. Furthermore, Ginseng G115® positively influences and strengthens the immune system. For Pharmaton many clinical trials have been conducted and all indicate that the product is helpful in enhancing cognitive function and improving psychological conditions and physical performance.